Michelle Miklik shared this interesting article about some potentially valuable research underway at UAH. 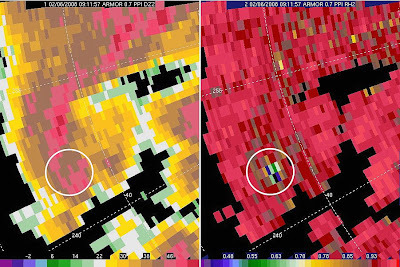 "An unexpected radar image of air-borne debris from the Feb. 6 tornado that killed four people in Lawrence County, Ala., might help scientists develop better tools for warning the public when and where strong tornadoes are on the ground. Scientists in the Earth System Science Center at The University of Alabama in Huntsville (UAH) are studying radar data from the early morning tornado to see if the radar signature from the debris is so distinctive that computers can be programmed to instantly recognize it, so more timely and precise warnings might be issued."